TDR-420 is a hand held Time Domain Reflectometer designed to identify and locate faults in power, telecommunications and teletechnical cables. 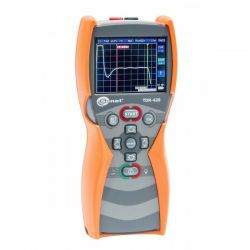 TDR-420 reflectometer allows to measure the length of the cable and determine the distance to damage or impedance variation in the range of 4 m to 6000 m in conductors with metal wires. The shortest measuring range of 7 meters and a dead zone of 0.6 meters allows to locate damages at a very close distance from the place where the device is connected. Two cursors allow to determine the place of two damages simultaneously and the distance between them. Thanks to the color 3,5” TFT display with a resolution of 320 x 240 pixels, the indication of the location of the damage is precise and the results easier to interpret.